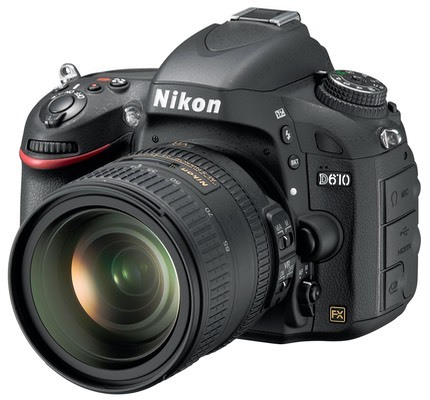 Nikon today announced a new camera, the D610, which should be on dealer's shelves by the end of the month. The question is "why"? Yeah, that's it. It's a bit like an automaker announcing their new model year vehicle and telling you that the only change this year is a price adjustment and a new badge. Nikon's press release seemed to not quite know what to say about the new camera, though I have to gasp at audaciousness of the headline in the US press release: "Concentrate on the Clarity." What clarity would that be, Nikon? The clarity of a clean sensor that doesn't get random shutter debris on it? Given the tiny list of changes, the shutter issue has to be the reason why we get a new camera. Only problem? Nikon didn't actually address the elephant in the room with their introduction of this new camera. They seem to think that the serious photographer who might consider the Nikon D610 doesn't actually read the Internet and isn't aware of the problems D600 users have been having. In case you've been in a coma for over a year: a large number of D600 users report excessive debris and lubricant splatter on the sensor, requiring frequent and repeated cleanings. Quietly, Nikon has been replacing shutters on a lot of the D600's that come back to them with dirty sensors, even refurbished D600's out of warranty. Nikon seems to think that adding 10 to the name automatically makes the new camera problem-free in user's minds. Problem solved. Not so fast, Nikon. Folk that already have a D600 are now suffering another blow: Nikon has devalued the D600, especially considering the new lower list price of the D610. Folk previously considering the D600 and now the D610 are still wondering whether there's a shutter that still sheds in the camera. Frankly, this was a sloppy way to deal with a real problem, and all Nikon has done is made a lot of loyal customers start to doubt Nikon's integrity. Nikon's like a magician who forgot to wear a jacket and long-sleeved shirts. Yeah, there's nothing up the sleeve because there's no sleeve, so we can see everything they're doing. And heaven help Nikon if the D610 turns out to have a QA problem, too. Bottom line: this is Nikon's most lame new DSLR introduction since the D70s. Heck, we didn't even get an s this time.